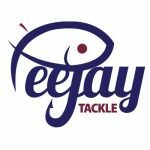 Everyone has a smart phone these days and apps are big business and with supposedly millions of anglers in the UK alone, more and more apps are being developed that are aimed at anglers. 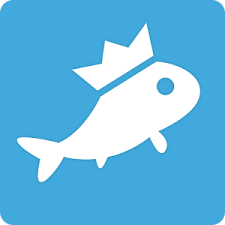 I first became aware of Fishbrain some time ago, it started life in Sweden and I seem to recall it being touted as the fastest growing fishing app (don’t quote me on that!). Fast forward a year or so and I was contacted by Fishbrain asking if I would be interested in the app, as it happens I’d already downloaded it (and it’s free!) but had never really done much with it so I said I would take a look and review it on my blog. To be honest I’m not really big on apps, I know there are some amazing ones out there and you can get an app for almost anything but I’ve always dismissed most of the fishing apps as a bit gimmicky and couldn’t really see how they could improve my angling results. I can see how they can be useful as a directory of venues and fisheries with contact details etc but I can also see limitations with this kind of app as they have to be kept up to date and with thousands and thousands of venues out there, it’s a mammoth task. There are some huge numbers there but maybe not as large as you might expect given the numbers of anglers in the UK let alone the US. Mind you, what would I give to have half a million readers! Anyway lets have a look at the app, on opening, the first page is a newsfeed where you will see the latest photos from anglers you follow and you can like and comment, so sort of a fishy Facebook! On the bottom of the screen there are five menus, Feed, Explore, +, Activity and More (see photo below). After ‘Feed’ I looked at ‘Explore’ and if you have location enabled on your phone the map will zoom to your location and you will notice in the photo below that nearby are a number of little grey or blue fishy icons. Tapping on these brings up the location of a fishery, in this case the River Isle, if you click on the info button, further information is brought up and you can add comments or a catch (nobody had so far!) and the number of followers is also displayed. I also looked at the River Tone which had a couple of catches (both by the same angler) which made him ‘King’ of both species for that river and then there was quite a bit of info for each catch like Fishing Method, Weather, Wind Direction etc. I can imagine this creating quite a bit of competition between friends in a bid to become ‘King’ of their favourite venue but I also think it’s open to abuse with regards to fish weights. I’m also not sure on where the data for air temp, pressure and humidity come from, maybe this will become obvious as I become more familiar with things. The ‘plus’ button in the centre allows you to upload your catch photos or add a ‘Moment’ when you are out on the bank, this could be a catch photo or a wildlife shot, anything really and you can add a description and your location. ‘Activity’ is basically anything your friends have been up to such as commenting on photos, that type of thing. Lastly is the ‘More’ menu and there are loads of sub-menus here. 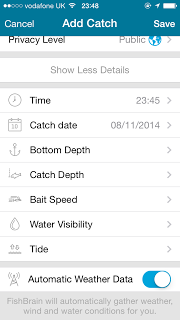 ‘Catches’ is the first option and unsurprisingly all the latest catches are displayed here, you can change the display by date, weight, length and all catches or just the ones with photos. The default display is with photos and the most recent catches which makes sense. 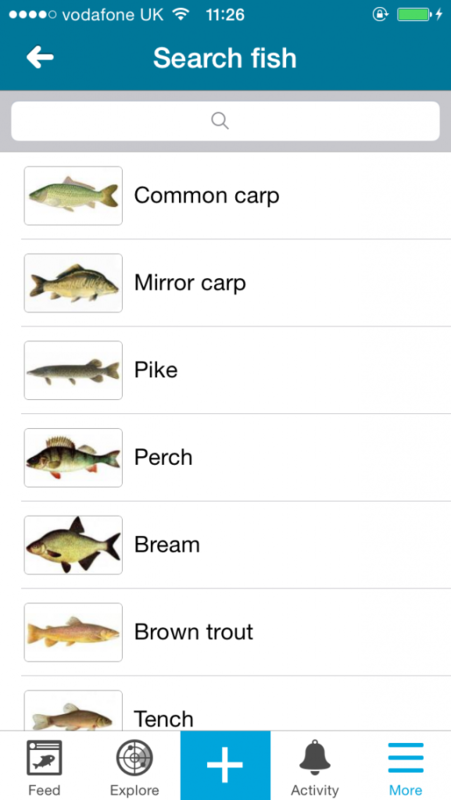 You can also filter by Details, Conditions, Fish Species, Baits or Anglers and I tried filtering using tench as an example and it worked really well. The ‘Analyzer’ section allows you to get deeper insights into the database but as you needed to pay for this service (£3.99 for a month or £27.99 for a year) and I’m a tightwad, I can’t really give you anymore info apart from it looks like you can get allsorts of stats on things like Moon Phase, Water Visability plus Personal Stats. It goes on to say you can work out the best tactics on your favourite lake and when is the best time to go fishing, if only fishing were that predictable!!! Saying that, wouldn’t it be boring if it was! With the Personal Stats, apparently you can become a better angler with detailed statistics on your own fishing, now I’m not so sure about that but it would be interesting over time as you entered more data to see if any patterns emerged with your fishing. The ‘Anglers’ section shows Featured Anglers, Nearby and Most Active although bizarrely it listed anglers in Sweden and Norway as being near to me when there were quite a few anglers based in the UK! 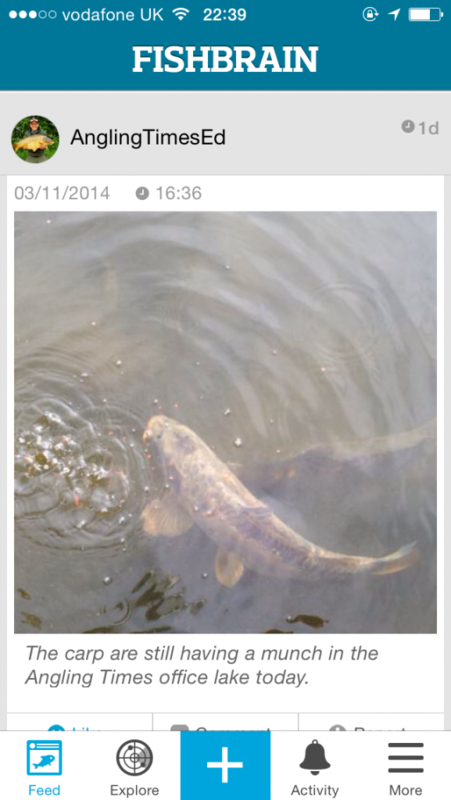 Here you can also follow anglers and see what they’ve been catching and on what bait etc. Then we come to ‘Fish Species’ where you click on the species you are interested in and it gives you some basic info and two options Analyze (which is a Premium service you have to pay to use) and Catches which is very similar to the option described in the previous paragraph but obviously relates just to the species you are interested in. Then we come to ‘Premium’ which as far as I can see is exactly the same as Analyzer! Obviously they want you to become a paying customer but to keep pushing the big sell is a bit irritating and does annoy me somewhat. ‘Real Time Logging’ lists a number of fisheries close to your proximity but judging by the list of venues displayed near me is by no means exhaustive. Basically it’s a timer which you start at the beginning of your fishing trip and you fill out which fish you are targeting and with what method and bait. You can add photos and comments and your trip is then available for people to see in their feed (I guess they have to be following you). Its a nice idea and you can log when you change baits or which species you are targeting but if I’m honest I can’t see me ever using this feature. ‘My Profile’ is pretty self explanatory and it displays your profile pic and lists your followers and who you are following. Your catches, fishing trips, records and tackle box can also be found here and of course there is the obligatory statistics option which you have to pay for (surprise, surprise!). The last two options here are an invite button where you can find friends via Facebook, your address book or you can e-mail them and a button so you can log out. I’ve had a bit of time to play around with the app and I have to say I think it’s got potential, it’s one of those apps that will get better the more people start using it and entering information. I do have a few issues with it, firstly it was developed in Sweden and by their own admission they are aiming it at the US (and why wouldn’t you with the figures mentioned earlier!) but with both of these countries they do a lot of lure fishing for game fish and of course bass fishing is huge in the States and this is reflected in a lot of the menu choices when you go to enter catches etc. 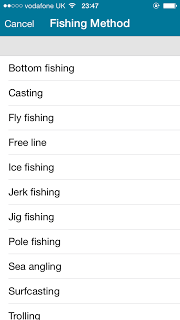 As you can see from the photo below, there are only a few methods that would be relevant to the fishing I do, although some would say ‘Jerk fishing’ is quite apt! More options aimed primarily at lure and sea anglers but at least I’ve found the menu where the weather details come from! 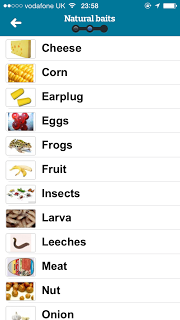 Similarly when you go to enter the bait you caught your fish on, you can choose from ‘Flies’ or ‘Natural baits’ but when I clicked on the latter there were some odd choices like earplugs and frogs, I couldn’t find casters or maggots! although there was a larva option. 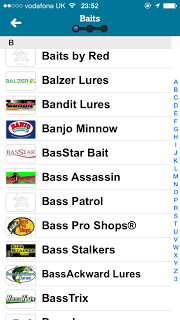 There is also an alphabetical list with a vast array of bait and tackle firms, many of them I didn’t recognise and clicking on a random selection, the majority listed lures of every type imaginable. Scrolling through I did find quite a few of the big UK firms like Bait Tech, Dynamite Baits, Marukyu and Mainline but if you caught on a generic pellet like a fisheries own brand for example, I can’t seem to find an option for that. I can’t see many choices on the ‘Natural Baits’ menu getting a lot of use in the UK! Loads of choices for the lure and bass anglers! I think, if anything, this app is trying to do too much when they could almost customise it for a particular country or discipline (i.e. 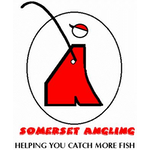 coarse fishing, sea fishing, lure fishing etc). 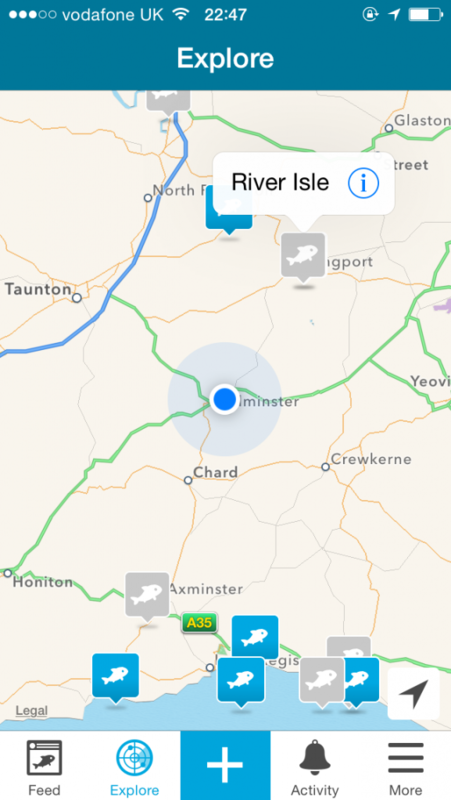 I can see lots of pleasure anglers using it as there’s loads to do and lots of info on venues but as I’m primarily a match angler there isn’t much aimed at me with this app and I think they’re missing a trick there. I’m sure they could easily add a section on the venues pages where the latest match results were published showing which were the best pegs, what species were caught and on which method. I’m sure match anglers would be interested to get the latest info on the venue they are fishing that weekend. Contact details for each fishery could also be included and what facilities are on site (toilets, tackle shop etc). At the moment they are trying to cover every country, venue, species and method which is a mammoth task and they are only touching the surface in a lot of cases. Take the fishing methods for example, float and feeder fishing are both missing which probably account for the majority of fishing done in the UK! Similarly some of the most commonly used baits are missing from the ‘Natural baits’ section but then in the baits index there are loads of options that will never be used. I’m trying not to be too negative as I think it has potential and I love the idea of anglers all over the world connecting via a kind of ‘Fishy Facebook’ I’m just not sure it’s possible and I think they may need to look at a FishBrain edition for the UK, US etc. I realise they are primarily targeting the US market which is fine but they will need to tweak it if it’s to become a major success here. I do think it’s evolving all the time as anglers input more and more data so I will keep dipping into it and I’ll keep this review updated when there are any major changes. Quick update – FishBrain have already been in contact (see the comment below) and have been pro-active in making some changes and also let me know that maggots and casters are in the bait menu under larva (along with some other options). They also seem really keen and open to taking suggestions on board and it looks like FishBrain might be becoming more match angler friendly, exciting times ahead I think! I will try and bring you updates as and when they happen. 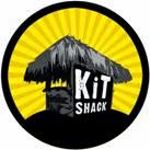 Hi Jamie and thanks for a superb review – and promise to update it after major changes! – Most importantly we are working on a relevant feed concept which allows you to follow the fishing methods and species of interest. App feed will become super interesting after the release! – Pellet (generic) is added now (can be found from angling-, carp- and natural baits). Btw, casters and maggots can be found under Natural baits » Larva. We will do a big update in our baits quite soon to add thousands of more baits but most importantly making it easier to find the baits you are using. – Float and feeder fishing methods: we thought that pole fishing covers them? Please correct and quide us more on this – feedback is very much appreciated. We are updating methods list very soon. 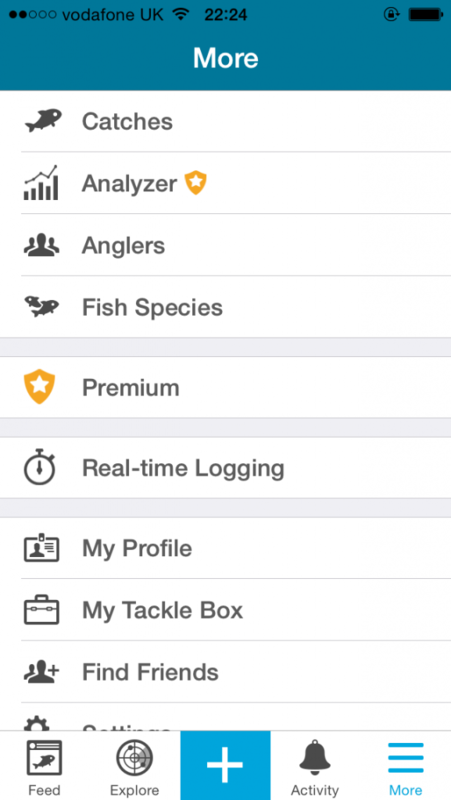 – Fishing venues page: we will figure out a solution for showing match results. Recently we tested this together with our friends at major Florida fishing tournament Big Mac Classic and Off Da Hook tournament fishing team. It will sure be possible to add fishing regulations, licenses, contact details as well as facilities: tackle shops, toilets, boat ramps, fire places,..
– Your comment about 'Real Time Logging' is correct. We are updating this feature, you will be surprised. 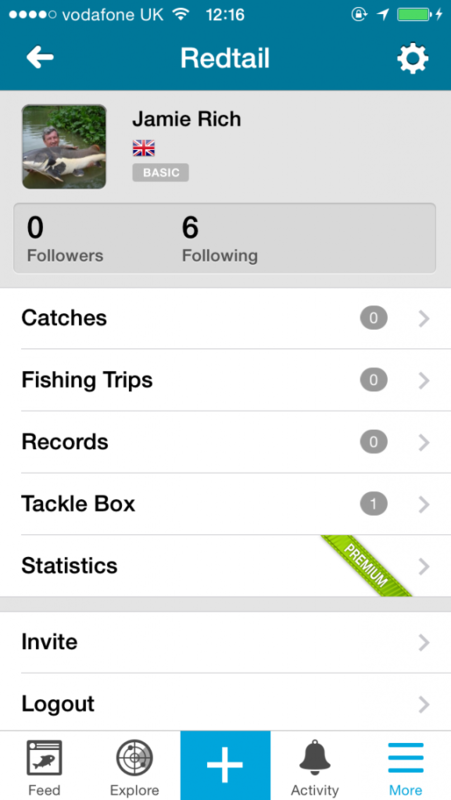 FishBrain will become a perfect companion also to a match angler! This is a promise. PS: Going premium is fun. Advertising it again ☺ By going Premium you can zoom into any Satellite Map area to analyze fishing spots. Premium members can also draw detailed analysis for fish species and baits of interest: catches, map, weather, tide, time and much more. 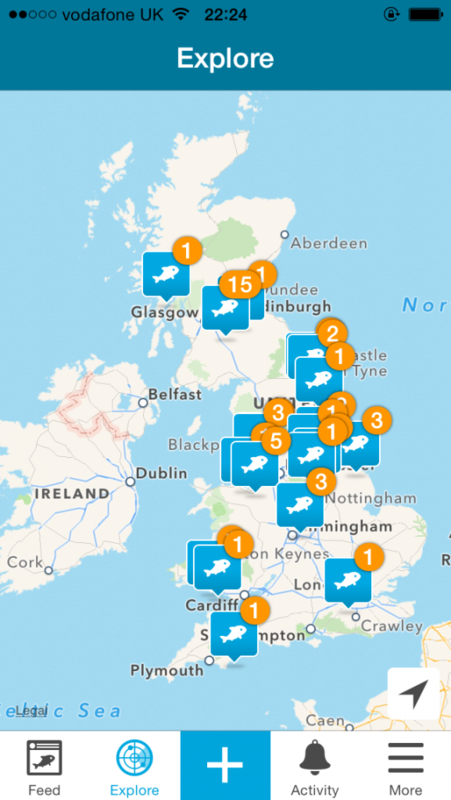 If you wish to stay Freemium you can use Explore map to view fishing waters individually.